Rusks: For those that have never experienced rusks, this is a hard dry biscuit OR basically a twice-baked bread. In France, you get small ones called ‘biscottes’ in Germany ‘zwieback’, and in South Africa ‘rusks’ or ‘beskuit’. And you get many varieties, from muesli, bran, aniseed to buttermilk. They are absolutely amazing dunked in tea or coffee. Might sound gross to some, but you can’t know if you haven’t tried!!! My memories of rusks, evoke my University days, where my mother used to give me a big bucket with a red lid, filled to the brim with buttermilk rusks. Each semester/term, I had a bucket. These were my “precious”. My treasures to share with all my dorm-mates on my floor….eating them whilst we studied for our next exam or swotted for our next assignment. They were my BEST!!! I absolutely adored them. And now I know how to make them….how I wish my mother still made them for me! Sigh [Mom, that’s a subtle hint]. For all the others….you are never to old to have your mom make your favorites or at least that’s my rationalization! Mix the butter and sugar together. Add the eggs and mix well. Now add the dry ingredients, and 1/2 of the buttermilk. Once mixed in, add the rest of the buttermilk. It will look very similar to a scone mixture. Its easiest made with a kitchen mixer using the dough hook or the K-beater hook. If you do with an egg beater, there will come a stage where you are going to have to knead the mixture with your hands! Bake for 180 degrees celsius for 1 hour. Remove, place on wire cooling racks to cool completely. Once cooled, cut into “soldiers” as thick or thin as you like your rusks (refer to my picture to get a guesstimate of size) and lay them in a single layer on your baking trays. Bake overnight at 100 degrees celsius (i.e. around 8-10 hours) – don’t bake at a higher temperature, since this will make them brown! The next morning, take out the oven and let it cool completely. Once cooled, you can store in air-tight container for at least 3 months. Enjoy with your next coffee or tea break. TIPS: add TBSP of aniseed if want aniseed flavor. 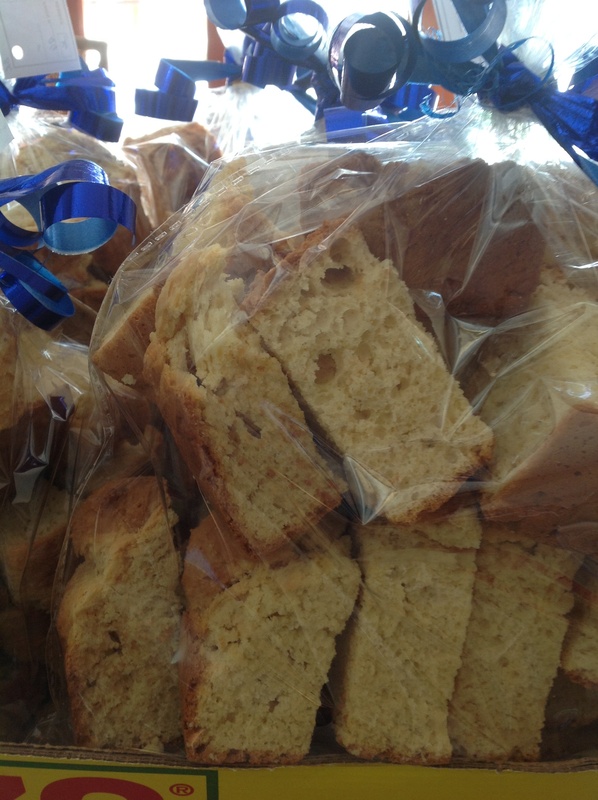 This entry was posted in Baking as easy as 1..2..3 and tagged beskuit, buttermilk, buttermilk rusks, rusks by angelb38. Bookmark the permalink.